Since our trip to Maine didn't work out, I spent a few hours yesterday playing with dye. I wasn't happy with how my first try at the watermelon design came out, so I gave it another go. I did two skeins... the first is a "seedless" watermelon since I wrapped up the watermelon color before I could dap some black on there. The second skein (which is the one that is knit up below) has seeds. I am still not happy with how the seeds are coming out, since the black dye is really hard to work with. I think it still is really cool though. Both of these skeins are for sale. If you are interested, please shoot me an email at dani44@hotmail.com. The yarn is 100% merino and is 440 yards. The recommended needle size is US1-3 and the gauge is 7-8 stitches/inch. UPDATE: Since so many people emailed me asking about the prices, both the tiger and the watermelon skeins are $20! You can get an adult pair of socks, plus a baby pair out each skein. If you definitely want some, I will be taking orders. Just email me your address and whether you prefer to pay using paypal or a check. Thanks! This morning I also did another tiger stripe skein. I don't have pictures yet since it is in the drying process, but it looks something like the one below. If you are interested in purchasing this yarn, please email me once again! In terms of dying, I am also playing with a few other design ideas. I think a "grape vine" and a "bumblebee" yarn would be cool. Anyhow, hope everyone is having a great Sunday! Forget ock camp, i want sock AND dying camp =) AWESOME job Dani! ock camp? yea, ok... my typing borders on pathetic!! Ohhh, bring on the Grape Vine! I can't wait to see that one. Lovely as always. I LOVE the watermelon sock yarn. I wish I could buy 'em now. Great job Dani! You're on a roll! Yummy. What dye are you using? 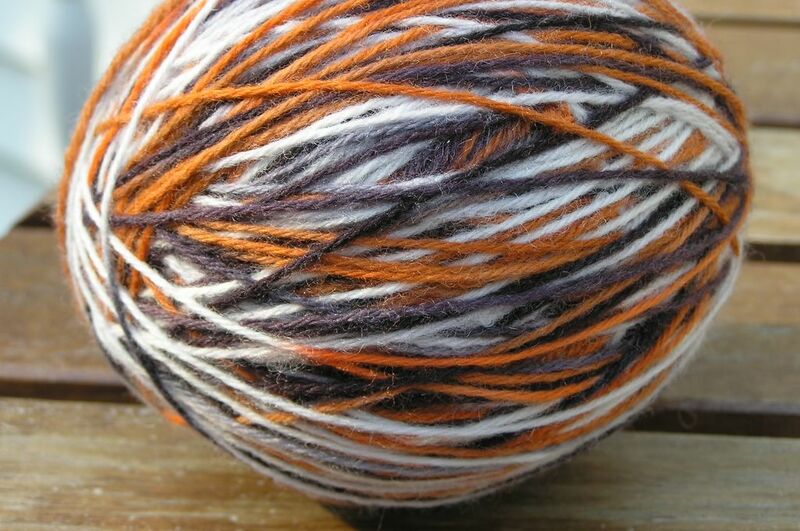 I ordered some knitpicks sock yarn and want to try dyeing it. I went to that natural dyeing class, so I may give that a try - just need to order the stuff. I love the bright colors and stripes (I may need advise on the stripe thing). The watermelon yarn is really fabulous. If I didn't have so much sock yarn right now I'd be all over it! 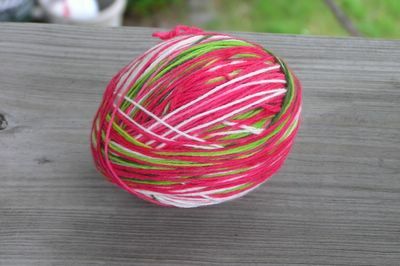 What a cute idea to make watermelon yarn! It looks like it knits up fabulously too. I'm jealous of your dying skill!! All those colors are BEAUTIFUL. I can't wait to see more!! You could do things like "Autumn Sunset" and "Blue Butterfly" and sell them for a million dollars!! Seriously. They're beautiful. looking good dani:) you are very talented! if you would do "earth day" again or maybe in some blues (like earth day stripe) i would absolutely buy some! I got a job again:) need my sock yarn fix! how much do you charge? psst! This is your needle exchange partner - You should keep an eye out for a box from knitpixie!! I've ordered through them and asked them to ship to you! Sorry to keep you waiting!! It sounds like things are going better over there and I am so glad - the bright sock yarns are a good sign! Wow. I think that covers it. How is it I've never read your blog before? Well, I've remedied that...got you Bloglined now. Awesome Blog! I added you to my bookmarks. My site is on corvettes if you would like to come and give me a review! ooo grapevine!!! yeah...put me in for some of that. Like to watermelon too!!! 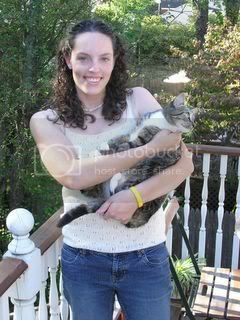 I love your yarn, especially your tiger. 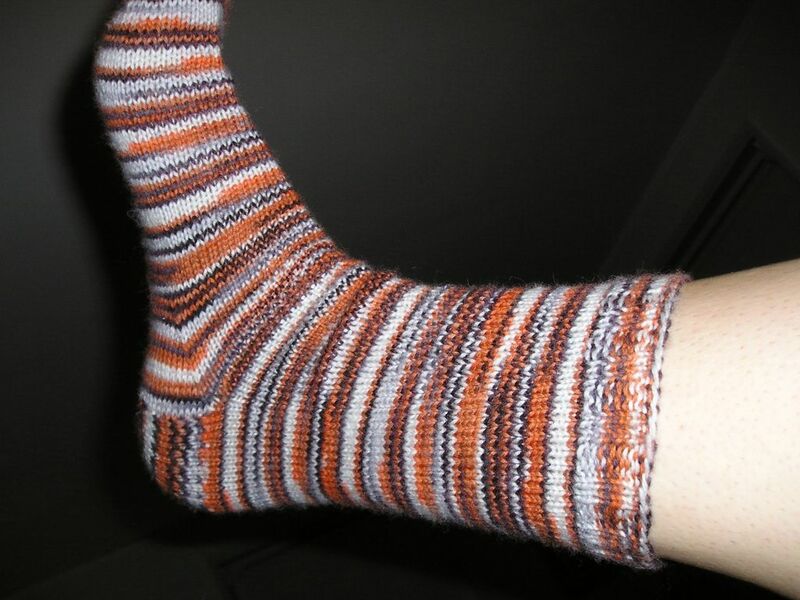 I dye sock yarn, too (ala Yarns to Dye For, which I figured you had too) but mine doesn't come out like yours. I still am using easter egg dye & kool aide, you must be using commerical dyes. After seeing your socks I will definitely have to switch! I am knitting a sock in Opal's "Tigerstripe" (the older yarn, not the new Rainforest) I think your yarn has a nicer result. I'd better check back for grapevine, because I collect "All Things Grape." 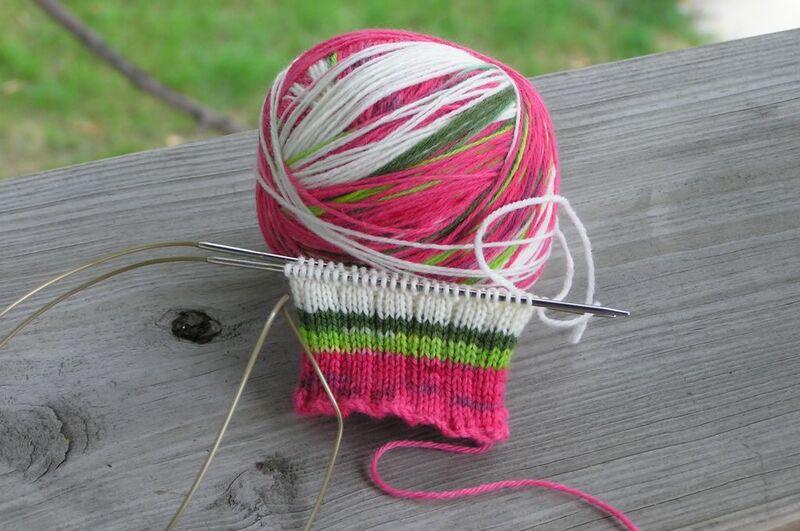 Are you still making the watermelon sock yarn???? PLEASE CONTACT ME!!!!! I want to buy some yarn from you!!! !